Banaba Island (/bəˈnɑːbə/; also Ocean Island), an island in the Pacific Ocean, is a solitary raised coral island west of the Gilbert Island chain and 185 miles (298 km) east of Nauru. It is part of the Republic of Kiribati. It has an area of 6.0 km2, and the highest point on the island is also the highest point in Kiribati, at 81 metres (266 ft) high. 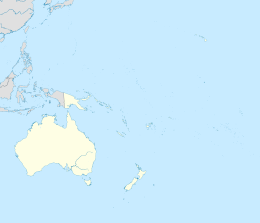 Along with Nauru and Makatea (French Polynesia), it is one of the important elevated phosphate-rich islands of the Pacific. Sigrah makes the controversial (and politically loaded) assertion that Banabans are ethnically distinct from other I-Kiribati. The Banabans were assimilated only through forced migrations and the impact of the discovery of phosphate in 1900. There used to be four villages on the island - Ooma (Uma), Tabiang, Tapiwa (Tabwewa), and Buakonikai. The local capital was Tabiang, now called Antereen. Banaba is prone to drought, as it is a high island with no natural streams and no water lens. A three-year drought starting in 1873 killed over three quarters of the population and wiped out almost all the trees; many of those who survived left the island on passing ships to escape the drought, and only some were able to return, often years later. The Pacific Islands Company, under John T. Arundel, identified that the petrified guano on Banaba consisted of high grade phosphate rock.The agreement made with the Banabans was for the exclusive right to mine for 999 years for £50 a year. The terms of the licenses were changed to provide for the payment of royalties and compensation for mining damage, amounting to less than 0.1% of the profits the PIC made during its first 13 years. The Pacific Phosphate Company (PPC) built the Ocean Island Railway and mined the phosphate from 1900 to 1919. In 1913 an anonymous correspondent to The New Age criticised the operation of the PPC under the title "Modern buccaneers in the West Pacific". In 1919 the governments of the United Kingdom, Australia and New Zealand took over the operations of the Pacific Phosphate Company. The phosphate rock-mining (for fertiliser), which was carried out from 1900 to 1979, stripped away 90% of the island's surface, the same process which occurred on Nauru from 1907 to the 1980s. Japanese forces occupied the island from 26 August 1942 until the end of World War II in 1945. The British authorities relocated most of the population to Rabi Island, Fiji after 1945, with subsequent waves of emigration in 1977 and 1981-1983. Some have subsequently returned, following the end of mining in 1979; approximately 300 were living on the island in 2001. The population of Banaba in the 2010 census was 295. Globally, there are an estimated 6000 individuals of Banaban descent. On Rabi Island the names of settlements are the same authentic four names from Banaba Island. Ocean Island Post Office opened on 1 January 1911 and was renamed Banaba around 1979. In the 1970s the Banabans sued in the Court of England and Wales claiming that the UK Crown owed a fiduciary duty to the islanders when fixing the royalty payments and the difference in proper rates should be paid. In Tito v Waddell (No 2)  Ch 106, Sir Robert Megarry VC held that no fiduciary duties were owed, because the term "trust" in the Mining Ordinance 1927 was not used in the technical sense, but rather in the sense of an unenforceable government obligation. The claim for the beach to be restored, from the 1948 agreement, was now time barred. The replanting obligations under the 1913 agreement were binding, but also they were limited to what was reasonably practicable. The woodland of Banaba is now limited to the coastal area and is made up mostly of mangoes, flame trees, guavas, tapioca and common Kiribati shrubs such as the saltbush. Having been mined for over 80 years, the centre of the island has no soil and is uninhabitable. The village Buakonikai (‘Te Aonoanne’) is now unoccupied. Banaba had three inhabited villages in the 2010 census; Tabwewa, Antereen (also called Tabiang) and Umwa. Banaba Island features a tropical rainforest climate, under Köppen's climate classification. Winds between north-east and south-east bring rainfall with large annual and seasonal variability. The period of lowest mean monthly rainfall starts in May and lasts until November. From December until April the monthly rainfall is on average higher than 120 mm. On 23 December, Reteta Rimon, Kiribati's High Commissioner to Fiji, clarified that Rabi Islanders were, in fact, entitled to Kiribati government benefits—but only if they returned to Kiribati. She called for negotiations between the Rabi Council of Leaders and the Kiribati government. Treasure Islands: The Trials of the Ocean Islanders by Pearl Binder (published by Blond & Briggs in 1977), an emotional account of the Banaban's troubles. Go Tell It to the Judge, a TV documentary by the BBC on the court case brought by the Banabans in London. It was first broadcast on January 6, 1977, shortly after judgement was reached. An account of the Banaban's struggle with the British Phosphate Commission and the British government, as of 1985, can be found in the book On Fiji Islands by Canadian author Ronald Wright. This also contains descriptions of Rabi Island, to which the majority of Banabans were removed after World War II. ^ The correct spelling and etymology in Gilbertese should be Bwanaba but the Constitution of Kiribati writes Banaba. Because of the spelling in English or French, the name was very often written Paanapa or Paanopa, as it was in 1901 Act. ^ Dahl, Arthur (July 12, 1988). "Islands of Kiribati". Island Directory. UN System-Wide Earthwatch Web Site. Retrieved April 14, 2012. ^ a b c d e "19. Banaba" (PDF). Office of Te Beretitent - Republic of Kiribati Island Report Series. 2012. Retrieved 28 April 2015. ^ Sigrah, Raobeia Ken, and Stacey M. King (2001). Te rii ni Banaba.. Institute of Pacific Studies, University of the South Pacific, Suva, Fiji. ISBN 982-02-0322-8. ^ a b Maslyn Williams & Barrie Macdonald (1985). The Phosphateers. Melbourne University Press. ISBN 0-522-84302-6. ^ Gregory T. Cushman (2013). Guano and the Opening of the Pacific World. Cambridge University Press. p. 127. ^ Takizawa, Akira; Alsleben, Allan (1999–2000). "Japanese garrisons on the by-passed Pacific Islands 1944-1945". Forgotten Campaign: The Dutch East Indies Campaign 1941-1942. ^ Burgess, S.M., The climate and weather of Western Kiribati, NZ Meteorological Service, Misc. Publ. 188(7), 1987, Wellington. ^ Wright, Ronald (1986). On Fiji Islands, New York:Penguin, p. 116. ^ Wright, Ronald (1986). On Fiji Islands, New York:Penguin, p. 152. ^ Wright, Ronald (1986). On Fiji Islands, New York:Penguin, pp. 115-154. This page is based on the Wikipedia article Banaba Island; it is used under the Creative Commons Attribution-ShareAlike 3.0 Unported License (CC-BY-SA). You may redistribute it, verbatim or modified, providing that you comply with the terms of the CC-BY-SA.